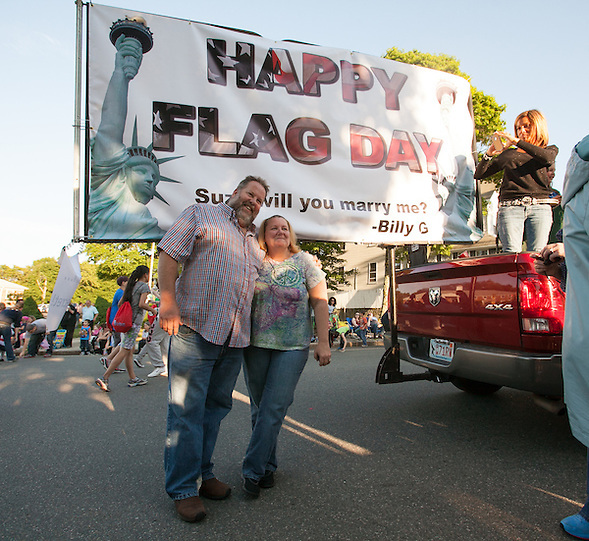 Dedham, MA 06/14/2013 A truck carrying a sign with Bill Guilfoyle’s marriage proposal rounds the corner toward his parade viewing spot on Walnut St.
Dedham, MA 06/14/2013 Friends and family members point out Bill Guilfoyle and Susan Roche as they ride on a truck carrying his marriage proposal in the Dedham Flag Day Parade on Friday. 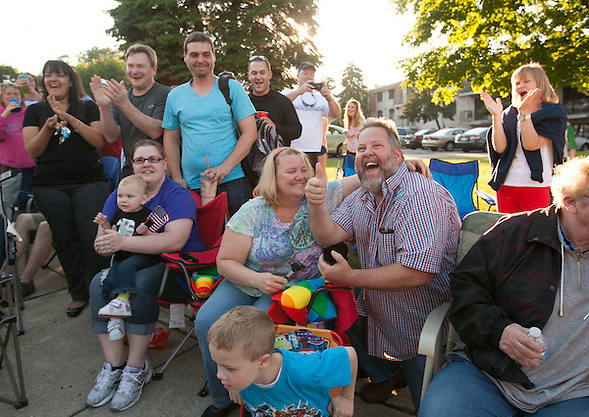 Dedham, MA 06/14/2013 Bill Guilfoyle is all smiles after Susan Roche accepted his marriage proposal delivered from the back of a truck in the Dedham Flag Day Parade on Friday evening. 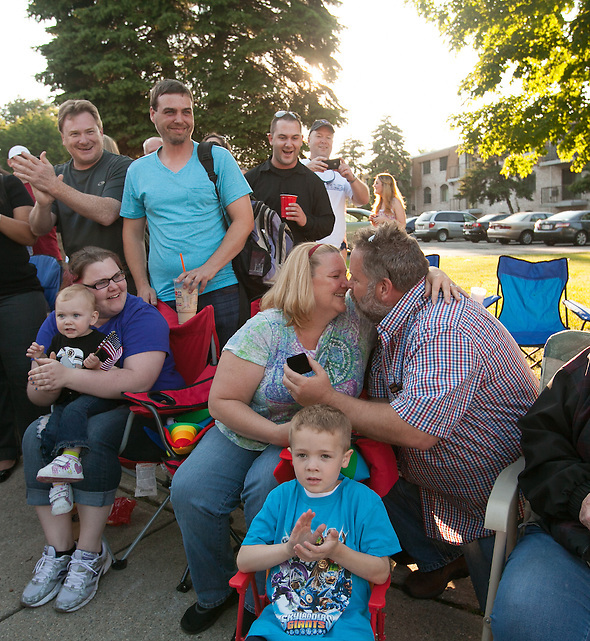 Dedham, MA 06/14/2013 Susan Roche kisses Bill Guilfoyle after accepting his marriage proposal delivered from the back of a truck in the Dedham Flag Day Parade on Friday evening. 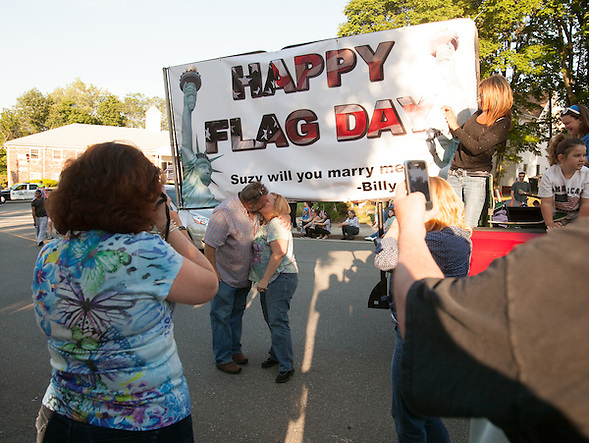 Dedham, MA 06/14/2013 Susan Roche and Bill Guilfoyle kiss after Guilfoyle proposed with a sign carried on the back of a truck in the Dedham Flag Day Parade on Friday evening. 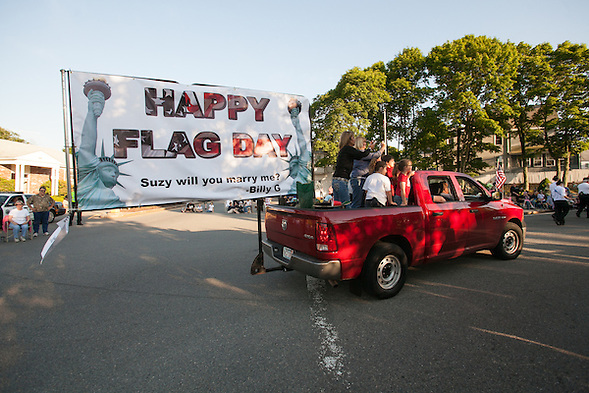 Dedham, MA 06/14/2013 Bill Guilfoyle proposed to Susan Roche with this sign carried on the back of a truck in the Dedham Flag Day Parade on Friday evening. She said yes. This entry was posted on Saturday, June 15th, 2013 at 9:30 am. It is filed under Photojournalism. You can follow any responses to this entry through the RSS 2.0 feed.